If winning back-to-back Stanley Cups were easy, every good team that hoisted the 34.5-pound trophy would do it again and again. That’s the rub when it comes to winning the Cup. Only 13 of the 30 – soon to be 31 – teams in the NHL have won it more than once and just 10 have managed to do it on three or more occasions. Doing it back-to-back? That is really difficult. The Penguins joined a group of nine teams that have managed four or more Cups last season, but they are also one of just eight teams that have managed to win back-to-back championships. They pulled off the feat 25 years ago, when they beat the Minnesota North Stars and Chicago Blackhawks in 1991 and 1992, respectively. Just one team has done it since. The Detroit Red Wings knocked off the Philadelphia Flyers in 1997 and the Washington Capitals in 1998. Do the Penguins have anything in common with that group from Detroit? One of the key reasons that championship teams have trouble repeating is the fact that they tend to deal with turnover and, usually, a lot of it. The salary cap in today’s NHL plays a big role in forcing those changes. It takes a full team to win, and even the fourth-line grinders want a bigger piece of the financial pie. General managers are faced with some tough decisions. Teams trying to get what you have will poach players, even if that means overpaying them. The Red Wings didn’t have to deal with that as they came off of their Cup win in 1997. Without a salary cap, they easily were able to bring back 19 players the next season. General manager Ken Holland, who debuted in that role ahead of the 1998 campaign, made a couple transactions but ultimately saw 17 returning players win that second Cup. It may be an anomaly, but the Penguins are bringing back 19 of the 20 players who were dressed for Game 6 in San Jose on June 12. Nine-time Stanley Cup winner Scotty Bowman, who was behind the bench for the Red Wings in both seasons, believes that bringing back so many of the same players was a huge key to their success. Having a coach who doesn’t play favorites and treats his 13th forward the same way he treats his top-line star goes a long way towards pushing a team towards success. It helps more if he has a system that suits his players and they execute it perfectly. The Red Wings had Bowman, who pressed all the right buttons with the help of his assistant coaches, and they implemented the left-wing lock. When that system was executed by the Red Wings’ skilled and deep roster, they created turnover after turnover and were almost always on the attack while stifling opponents with stout defense. Bowman wasn’t the kind of guy to coddle players. He sometimes even left his assistants to deal with them and served up tough love. He didn’t go easy on anyone regardless of stature in the locker room and it paid off in the end. Mike Sullivan is more of a players’ coach than Bowman, but he treats all of his players the same way. Evgeni Malkin is held just as accountable as Eric Fehr. No one gets away with a bad play or showing a lack of effort just because of the size of his paycheck. That sort of thing resonates with a player. They want to be held accountable. His system also worked supremely well for the group of the players the Penguins have. He allows them to skate hard and attack, but they are required to play defense. Even Phil Kessel, who spent much of his career focusing strictly on offense, is stranger to back-checking on this team. The NHL is a copycat league like professional sports. When something works for one, it is implemented all over. Bowman’s left-wing lock started to pop up around the league then, and it’s a near certainty more teams will play a speed game laced with plenty of skill to match the Penguins this season. The key is to do it better than the followers. 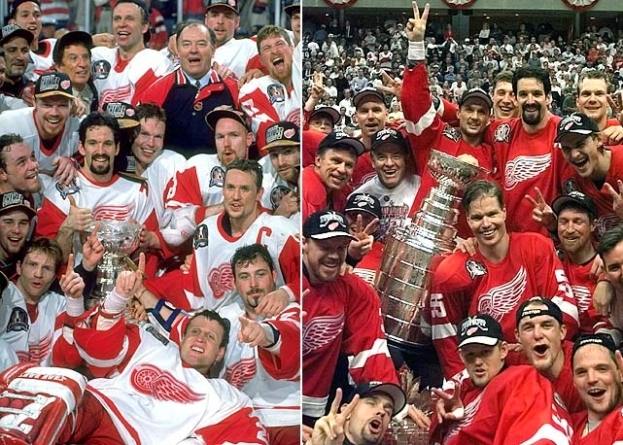 What the Red Wings did in 1997 worked just as well in 1998. Their 253 goals scored ranked sixth in the league in 1997. They managed 250 in a more defensive league the next season, but that was good for second. They allowed 197 goals to rank second in the league in 1997, and that forced plenty of their peers to tighten up. They allowed just 194 the next season, which ranked seventh. Their special teams were solid. The power play finished seventh and then sixth, while their penalty kill ranked fourth and then third. With so many familiar faces, it is safe to assume that the Penguins should be able to match or beat their 241 goals scored, which ranked third in the league, and their sixth-ranked 199 goals against. Their power play ranked just 16th at the end of the season, but clicked at 20 percent after Mike Sullivan took over. Their penalty kill was solid throughout and their 84.4 percent kill rate ranked fifth in the league. The Red Wings have the Penguins beat here. They lost defenseman Vladimir Konstantinov after he was involved in a limousine accident following the 1997 Cup victory. He spent several weeks in a coma before pulling through, but he suffered serious head injuries. He would never play hockey again, and his teammates rallied around him. The team wore patches featuring Konstantinov’s initials along with the word ‘believe’ in both English and Russian. He was still an official member of the team, and when they finally finished off the back-to-back victory, the Russian defenseman was pushed around the ice in his wheelchair with the Cup on his lap. The Red Wings had everything that was needed to win: A star in Sergei Fedorov, who put up 20 playoff points, stud defenseman in Nicklas Lidstrom, who some consider the best of all-time, and a great leader in Steve Yzerman, who owned the locker room and had the respect of every player on the team. They had scoring depth that started with Brendan Shanahan’s 28 regular season goals and four lines that could grind opponents down. There was also the Russian five (or four, because Konstantinov was out). The group of Igor Larionov, Viacheslav Fetisov, Slava Kozlov and Fedorov wowed teams into submission with puck skills, speed and a deadly offensive-zone cycle. There was a great checking line featuring Joey Kocur, Kirk Maltby and Kris Draper, a force in Darren McCarty and a solid, if not spectacular, goaltender in Chris Osgood. That goaltending spot is one that changed between seasons. Mike Vernon manned the crease the first time around, while his backup Osgood won it in year two. The Penguins match up well here. They have the leader, who doubles as their superstar, in Sidney Crosby. They have a stud defenseman in Kris Letang and plenty of depth at almost every position. They play solid defensively. Marc-Andre Fleury and Matt Murray give them a goaltending tandem that would turn any general manager in the league green with envy. There’s also Evgeni Malkin, Patric Hornqvist, and the HBK line. The Stanley Cup has been won 11 times since the salary cap was implemented, but no team has been able to win back-to-back championships. It would be folly to think the Penguins could sustain the same level of play that carried them through March, April and the entirety of the playoffs last season for an 82-game schedule, but that’s the luxury of the regular season. It allows a team time to weather any storms, shake off any lingering Cup hangover in October and November as well as get through any injuries. It sounds simple, but won’t be easy. Defenseman Trevor Daley succinctly summed up the process.